Bengali food is much different from the cuisines in the other parts of the Indian subcontinent. Not only do we use paste and powdered spices, but the addition of sautéed whole spices before adding the main ingredients is what makes the recipes very unique. Most non-Bongs have an impression that Bengali food is all about fish, but its not. Check the vegetarian section of our blog, and you’ll know am right. And, that too those are just a droplet from the ocean on authentic Bengali vegetarian recipes. Pumpkin with its hard shell and soft inside is one of the commonly used vegetables in Bengal. It’s inexpensive and filling. Boiled and mashed pumpkin with a hint of mustard oil, green chilies and salt can give a good competition to the western mashed potato. The ash gourd on the other hand is not a regular in the Bong kitchen, but a tutti frutti cake with its candied version is always welcome. Dui kumro or two gourds is a typical Bengali recipe prepared with pupkin and ash gourd (winter melon/ white gourd). It is easy to prepare and gets ready in minutes. •	Add all the paste and powdered spices and mix well with the vegetables. Season with salt and throw in the green chilies. Pour about ½ cup of lukewarm water and cover till done. 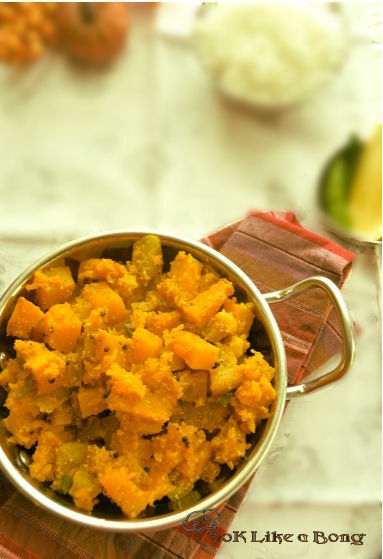 Hot Tips – To prepare this recipe quickly the trick is to chop both the gourds in the same way. First make a half inch slice and then chop each slice laterally into half inch pieces. How to make mustard paste in dry grinder? For this recipe add about 3 teaspoon of mustard seeds (equal portions of yellow and black mustard or just black mustard, your choice). Grind in a coffee grinder till the texture turns powdery. transfer to a bowl and add water. You can add chopped green chili, salt and turmeric in the same paste and give it a spin in a wet grinder. Sending it over to Foodabulous Fest Event organised by Preeti’s Kitchen Life. This looked tempting but turned out meh. Didnt get the zing of the mustard which I’d hoped for , tho the paste was aromatic. Was a bit bitter and didnt taste of anything much.. Sorry to hear that it turned out the way you expected. Old mustard seeds when made into a paste will taste bitter. Already liked your FB page. Thanks for stopping by and please send in your entries to the Holi event and giveaway. Very nice dish and well presented. The recipe is new for me and must give a try if I can get some chal kumro..
Its really easy and a very good side for a week night, cooks fast and tastes heavenly. Let me know when you prepare it.